The market managed to close slightly below the Trend Average, signaling a possible stronger correction starting next week. 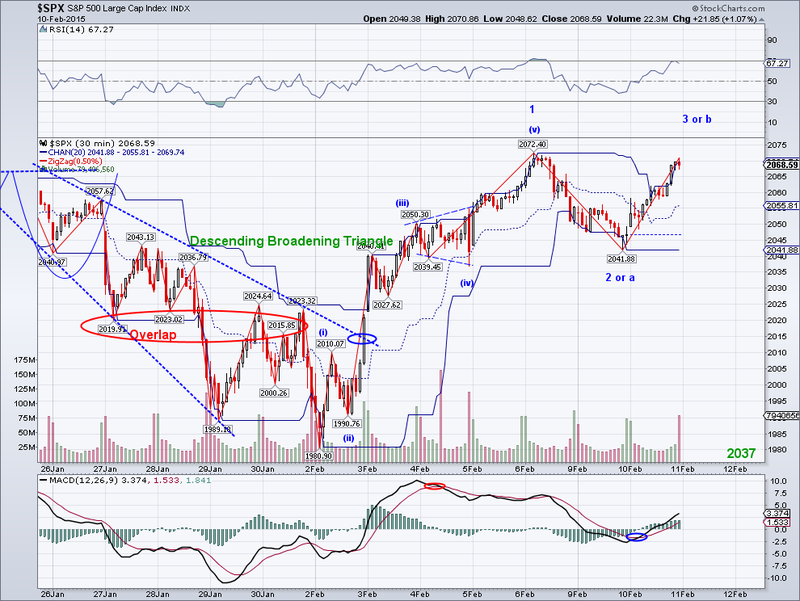 So far there's a target of 2086 if the selling gains momentum, but first the market needs to break 2103. Alternatively, the selling in the last couple of days could be viewed as a minor correction that will lead to another bullish run next week but the market must trade above the Trend Average (2107) for this to happen. I've been waiting to short (for hedging purposes) for weeks, but I rather wait longer until a clear opportunity presents itself. In the meantime, I continue to be long and hoping for a break out in the Chinese ETFs I have. Today was a 6+ year high, so it's looking very promising. The market went into a correction mode today and tested its Trend Average before bouncing back, eliminating the micro-count I had been following. Still, the market looks like it corrected enough to launch another rally to a new all time high so we'll see how the wave evolves before labeling it. Like I've been saying, a rally to 2150 before a substantial correction would be best but there are 5 waves in place and we could see a turn soon, specially considering oil has lost its TA and headed towards a test of the lows. Oil continues to support the stock market, but now that its 50 DMA was tested today at $53.92 as I had been expecting, we could see a resumption of another bearish wave in oil. Which in turn could be used as an excuse for the stock market to sell off again. With that said, this bearish in wave in oil could be its last. So once that excuse to sell is over, we could see renewed optimist in equities and consequently new all time highs. The bottom line is the world continues to grow and so will profits. Just look at the Apple money beast, which is technically not even overpriced, even at a $750 billion market cap. The market made another all time high today as expected but the move was not as strong as I had been anticipating. 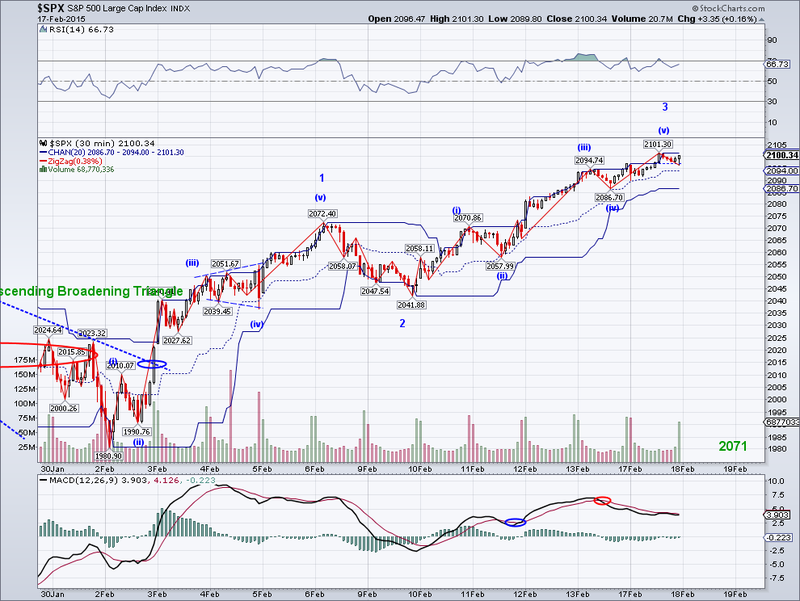 Technically speaking, a top at these levels satisfies the 5 wave count from 1980. But I continue to favor a rally towards 2,150 before any significant correction, and by that I mean a move below 2085. 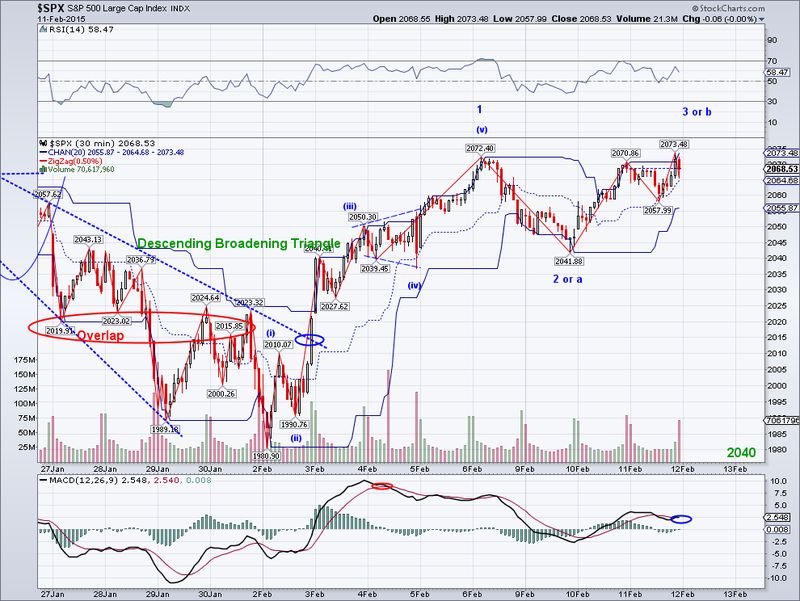 The market just needs a good excuse to complete the micro-count and then we can start talking about downside targets. All major indexes closed at all time high today and the good times continue. 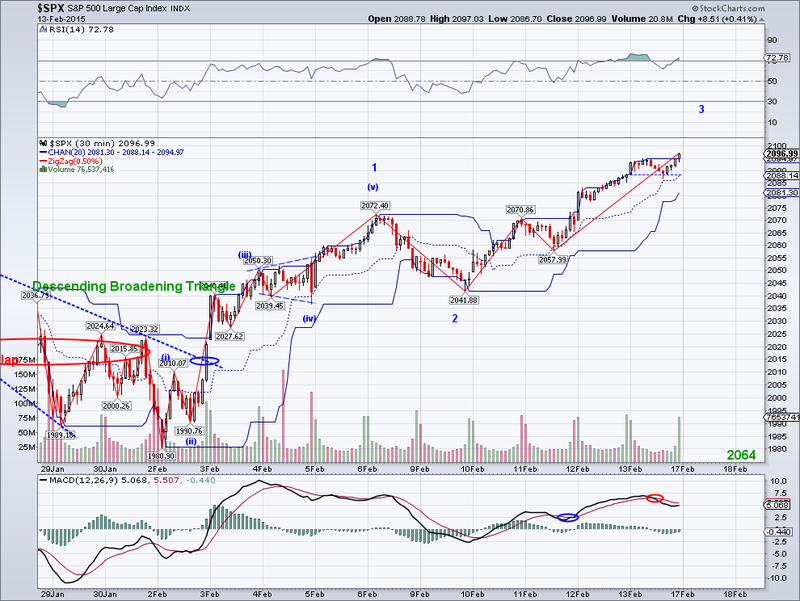 The count remains the same and hopefully we'll see a bullish trust to finish up the (III) wave tomorrow. If we get a decent bullish move, I will probably start building short positions to hedge longs. At some point towards the end of this week or next week we should see a correction to the Trend Average which has now reached 2100. The most likely catalyst for a correction looks like it will be oil, which I am expecting to test its $43.58 (WTI) low since its TA has turned bearish. It will be interesting to see oil make lower lows and it will definitely be a great buy again for another swing trade. 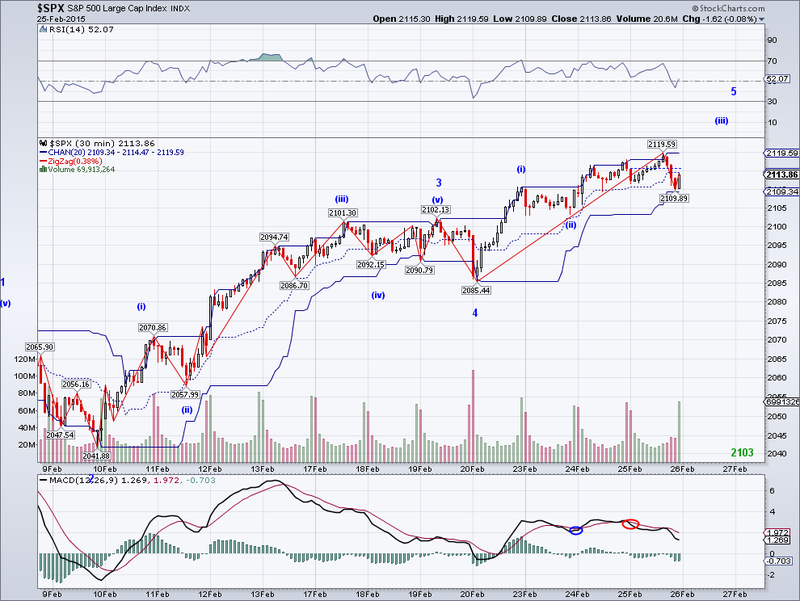 The market "corrected" as expected on what seems like a (II) of W5. 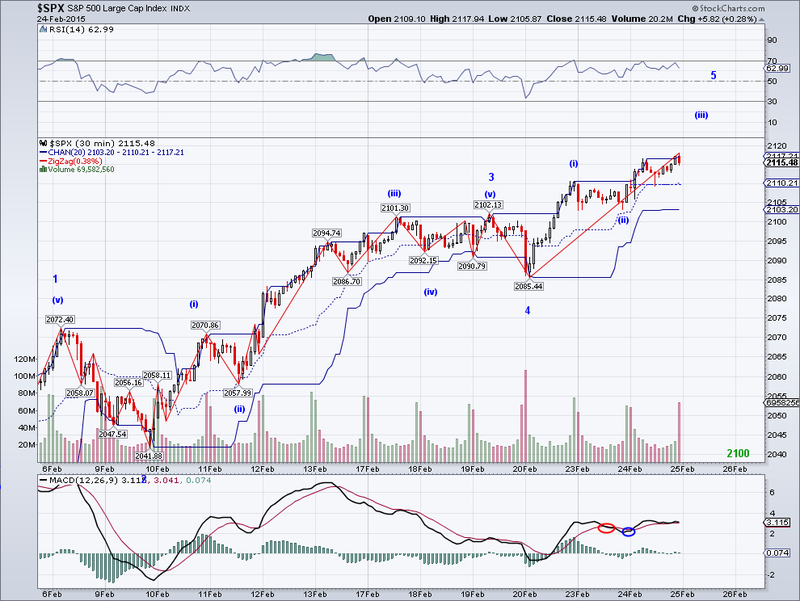 And this lines up well with the 2150 target for the completion of W5 if we get a 5 impulsive count. The oil sell off is not affecting equity markets for now, but perhaps it will be the reason to start of a correction once the 5 waves are completed. The oil excuse worked well in January and it should work again once buying exhausts in stocks. "The bottom line is bears had an opportunity to bring down the market in the past 4 weeks but prices are still above the 50 DMA. 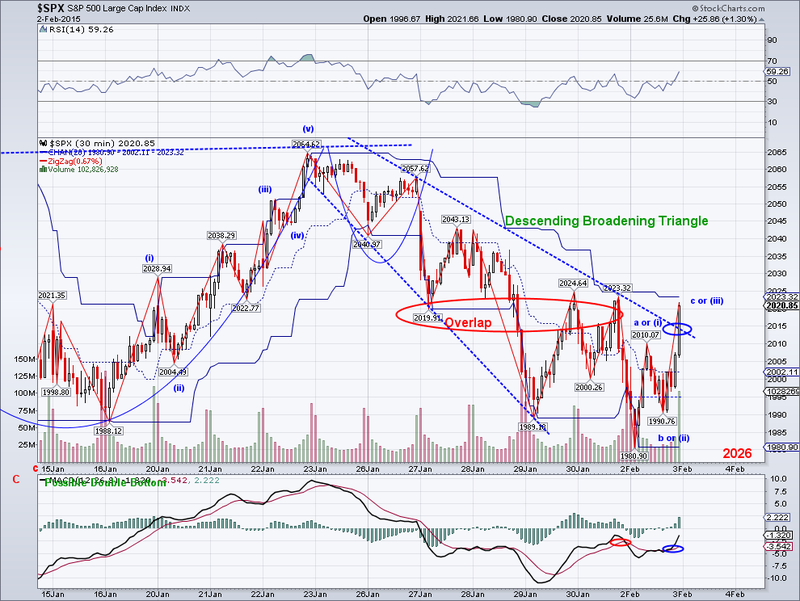 And now that oscillators have reset, odds favor sentiment swinging towards the bullish side." It was just two weeks ago that I posted the statement above when the market started trading above its 50 DMA, and now we are seeing what bullish sentiment looks like with new all time highs in all major markets (post-bubble in the Nasdaq). Now, with that in mind, we know better because we are counting waves here. And it seems like the W4 was the quick bearish move early morning and now the market is working on its 5th wave towards 2150, assuming the 5th wave will be at least the length of the 1st wave. 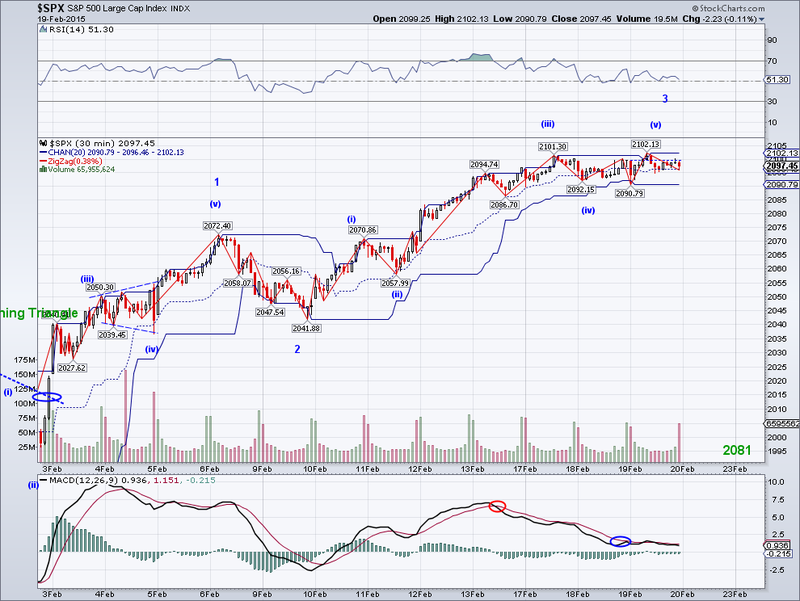 The cash market chart has the W1 at 2072 and W2 at 2041, but I favor the wave count that takes into consideration the pre-market action that had W1 at 2050. If we use pre-market prices, W3 looks like it started around in the 2025-2030 cash equivalent and the "look" of the entire structure from 1980 would make more sense. So, I continue to expect new all time highs continuing in the next week or two until the market finishes the count. Once all the buying exhausts, maybe the market will start paying more attention to Oil, Putin, or whatever "alarming" reason to correct once again and bring back a healthy doze of bearish hysteria once again.. works like clockwork! I will definitely go short once the structure completes, just not sure if to hedge longs or to go net short on my trading portfolio. My longs in that portfolio have been there since October if I remember correctly and up quite a bit. Maybe I'll get me some VXX and make enough money to pay my 2014 tax bill. 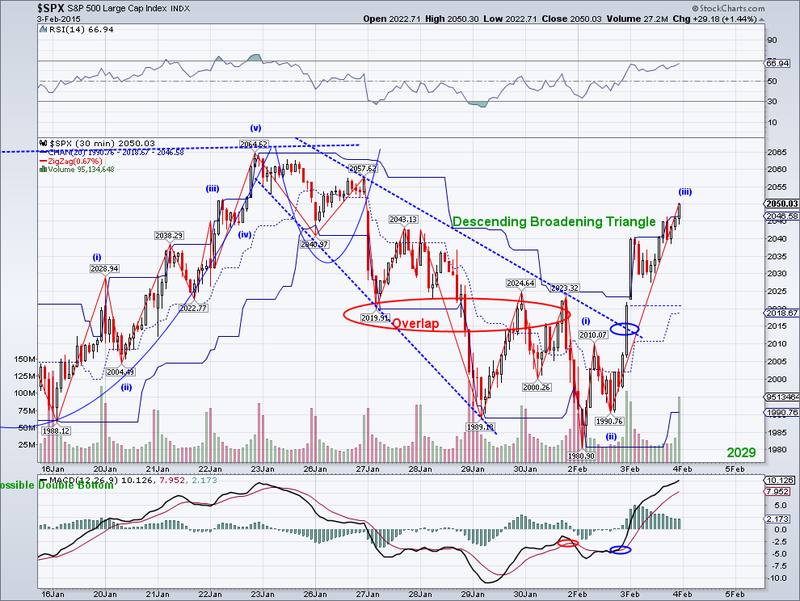 The market made a slight higher all time high today that could technically qualify as the (V) of W3. 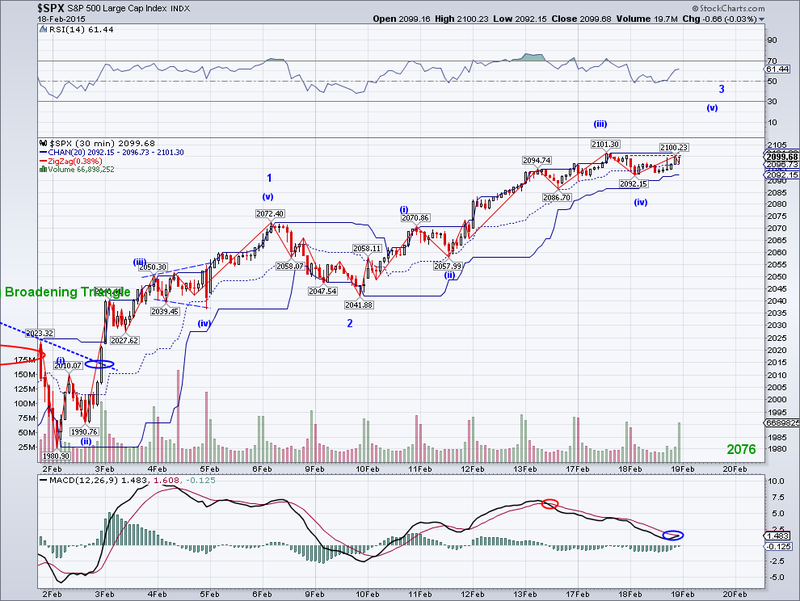 However, if 2102 is just the 1st wave of this (V), then I see target of 2120. It will depend of whether the market respects the 2090.79 low. Once the W3 is complete, we should see a stronger correction and perhaps one last rally towards 2150 to finish up the 5 wave count that started at 1980. If we get there, that's where I will start shorting to hedge or even take some profit and go net short on my trading account. The market started a minor correction as expected but it was so shallow that it raises the possibility of the W3 not being finished yet. So I am going to assume the top yesterday was just the 3 of W3, which allows for a 5 of W3 to yet another all time high. And perhaps then we will then see the Trend Average tested, which is at 2076 and rising fast. Maybe this year we will see the "Sell in May" scenario again after reaching a substantial high in April or May, so far the waves are lining up. And don't forget that big Inverse Head and Shoulders targeting 2400 is still in place. The market has made new highs as expected, closing at a nice round number of 2,100. 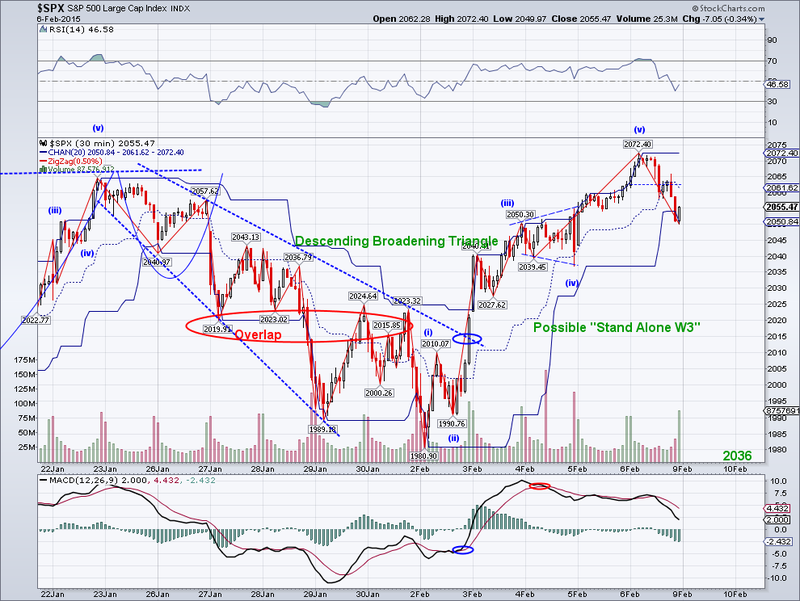 I see the W3 sub-division waves as completed, so I am assuming we will see a correction as soon as tomorrow for a W4. However, if euphoria is truly back, then we could see the market continue to go up slowly. Considering Greece and the EU failed to reach an agreement, the market is doing really well as news that would have caused a sell off a few weeks ago are now being ignored. 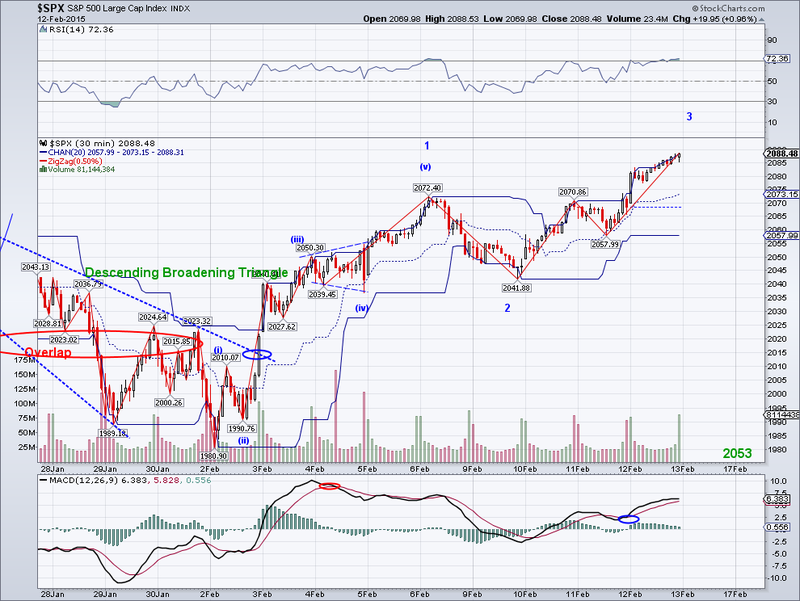 And I hope the rally continues so I can short (to hedge) this properly when the waves are completed. For now, my longs are looking good and probably will break out again soon. I posted the following almost a month ago and this is now the 8-9th time that we get new highs after the indicators I follow flashed oversold. "Every time the market has been this oversold, we have seen new all time highs in the past 2+ years and most recently in December. I don't remember how many times its been already but I think this is the 7-8th time the market has reached this oversold level since Feb 2012." And like I said on the same post, I am sure a top will eventually come and bears will finally be right. But that's after attempting to predict a top more than half a dozen times and possibly lose a lot of money trading against the trend. My point is, I know trending indicators will eventually fail because it is a lagging indicator. 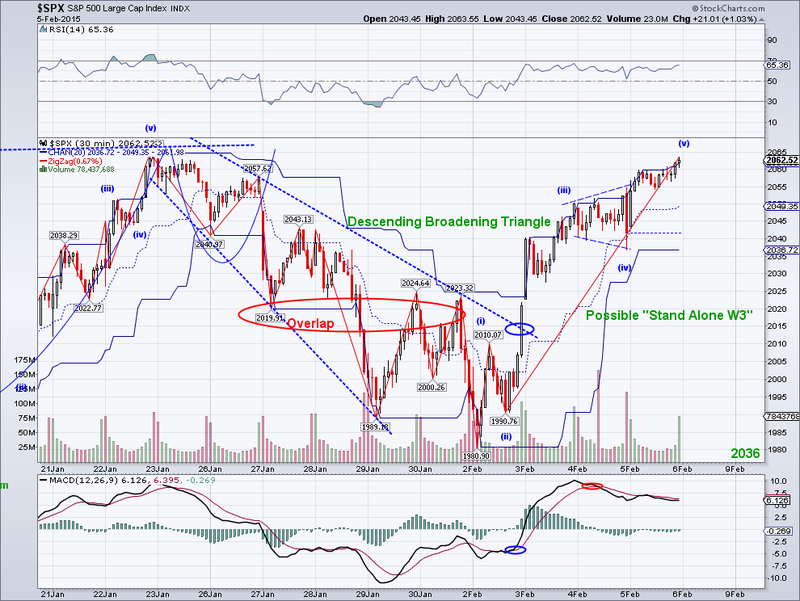 But odds far exceed attempts of calling a top by using fundamentals, orthodox Elliott Wave and other TA tools. In this case, the Trend Average has kept people who understand it on the right side of the trade for the last 3 years. That's one claim very few can make. I haven't had time to read the news today as to "why" the market went up, but I'm guessing the excuse is oil, central banks or Russia. But those are just excuses, as I mentioned several days ago sentiment was going to favor bulls and that we could see a wave to new ATH this week. This bullish sentiment can easily turn into euphoria. Just imagine if Greece decided to stay in the EU, that'd be the excuse to run the market to 2150+. I mentioned yesterday that sentiment was now bullish and since the Greece negotiation was postponed, no news is good news for stocks. Had sentiment been bearish, we would have seen "uncertainty" headlines and a sell off. But this is a market that wants to go up after correcting for over a month. The NASDAQ made a post-bubble high and it looks like it's going for its all time high this year. So highs should be coming to all indexes very soon, possibly by tomorrow. 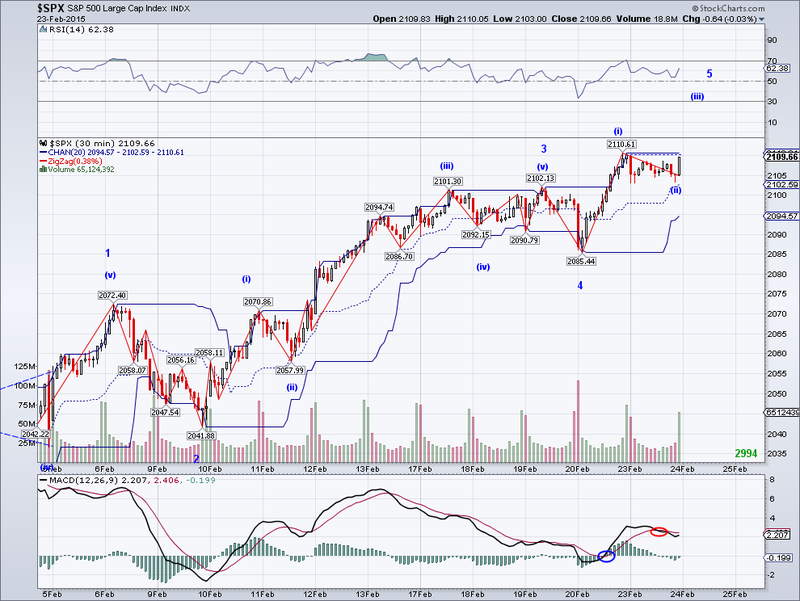 The target for the bullish 5 count using cash prices is 2210. But since we had that issue with pre-market a week ago, the W1 label could be at 2050 and not 2072. 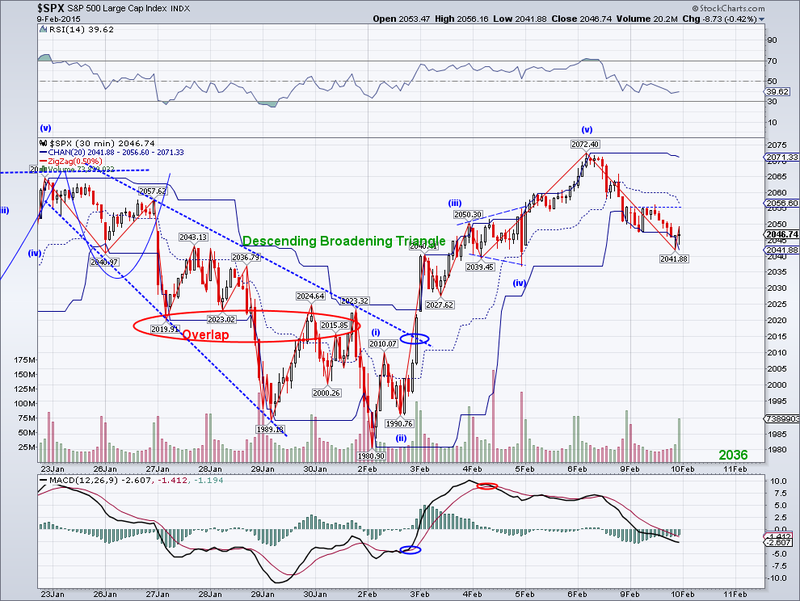 So if we taken into account pre-market then a 5 count targets 2150. My longs are doing pretty good and I will be looking to short to hedge once the 5 count ends or a bearish pattern appears. For now, it's time to enjoy the ride. The market continues to follow the possible bullish W3 count and it looks like the excuse will be the Greece negotiations with the EU. I believe waves can predict sentiment but not actual political outcomes, so if Greece doesn't leave the EU we should see the W3 materialize. But if the Greeks decide to leave the EU, then I assume there will be some sort of pattern failure as I can't imagine the market rallying. For now, all trends are back to bullish. Also, oil continued to sell off today and its TA is at risk of turning bearish. But the stock market doesn't really care, I'm sure if we get a big equity rally then oil could be used as an excuse to correct again. "Bears had an opportunity to bring down the market in the past 4 weeks but prices are still above the 50 DMA. And now that oscillators have reset, odds favor sentiment swinging towards the bullish side. Bears would need to bring the market under 2044 and close below this level to regain some control." We still need price confirmation to officially label the current wave a W3. But unless the market is doing a flat zig zag, chances are new all time highs are coming as soon as this week. Oil sold off today but the stock market dismissed the move completely, which means oil could probably test its lows and the market will be looking the other way. As I've been saying for weeks, all these headlines on oil, Greece, etc. are just excuses for profit taking. Unfortunately, people who trade on news usually end up holding the bag. Take the front page on the WSJ today, which I just took a picture of. Just when oil tested its 50 DMA and this headline came out, prices plunged. I wish I could have saved some headlines when oil was at $43, but it was the complete opposite with doomers calling for $20 oil.. I am 100% sure a top will come eventually when a thing called a "recession" finally re-appears. But in an environment where the Fed is telling you they are going to raise rates, it pays off to respect the trend and trade with it. The market started a correction as expected and we could still see more downside to the 2025-2030 area. 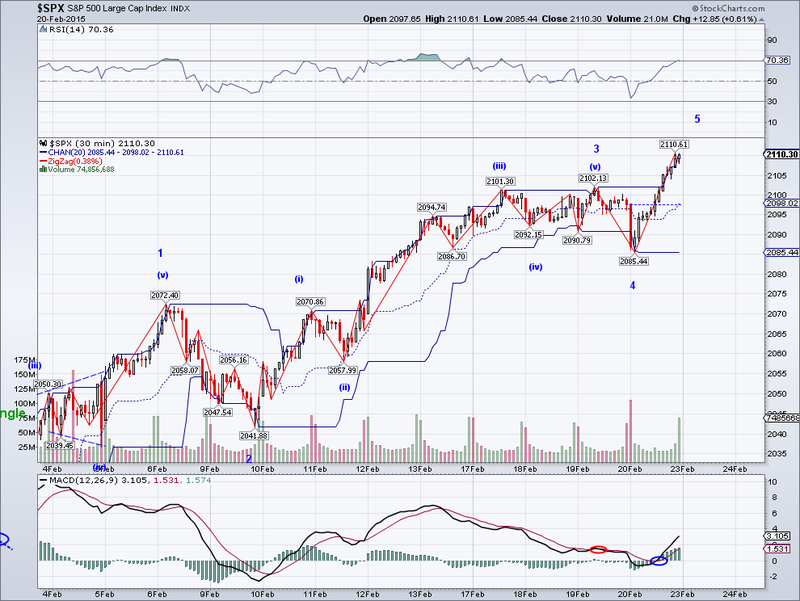 The big question is the wave after the correction is over, if it's a W3 then new time highs are highly likely. Oil continues to be support the stock market, but now that the 50 DMA was tested today at $53.92 as I had been expecting, we could see a resumption of another bearish wave in oil. Which in turn could be used as an excuse for the stock market to sell off again. For now, bulls continue to have the upper hand but need a good excuse to start a strong rally. Bulls managed to solidify their case by breaking the 2064 resistance and making a higher high for the structure that started at 1980. This makes it a 92 point advance and leaves the market just couple of percentage points from the all time high. We should see a correction as soon as Monday, possibly to the 2025-2030 area but we still have to keep in mind the possibility of a melt up in the stand alone W3 scenario I mentioned yesterday. The bottom line is bears had an opportunity to bring down the market in the past 4 weeks but prices are still above the 50 DMA. And now that oscillators have reset, odds favor sentiment swinging towards the bullish side. What bulls need at this time is a good excuse to rally. I ended up stopping out of my USO on my raised stop limit for a nice profit. There was a micro count that ended up being overlapping, so I am ok with locking in my profits and not stress about it over the weekend. We should find out soon if the current bounce in oil is a zig zag (which implies another bearish leg) or the beginning of a much bigger bounce. I hope we see another low so I can buy cheap again. Things got interesting last night as the market went down as much as 15 points. But the market bounced back after Europe opened and then started a rally at the open in the cash market. 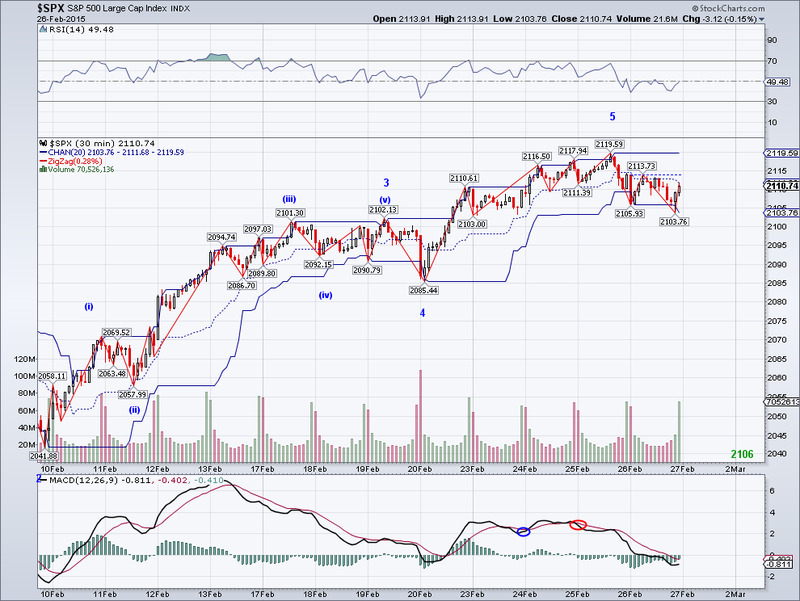 Technically speaking, the wave in the cash market is the 5th wave I was calling for yesterday. However, if we account after hours, the pattern did top yesterday and a W2 correction took place before the market opened today. So we could one of those "stand alone W3" patterns where the W2 is absent. Elliott Wave theory doesn't account for any of this, so this is just my own labeling. 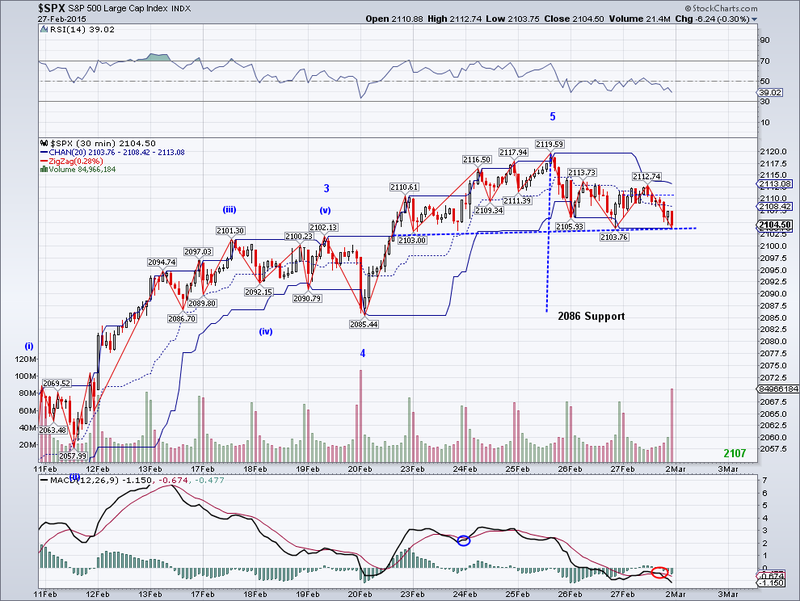 If the wave from 1980 to 2050 is a W1 of a 5 count, then we're looking at a target of 2150. Oil rallied as I expected today in what should be a C or a W3 wave and that allow me to set my stops to break even on USO. A continued rally or at least stabilization in prices will lend support to a stock market rally. Also, bulls could seize the jobs report tomorrow as an excuse to break out. A bad number will translate into a weak dollar, which will favor earnings. A good jobs number will push oil higher, so technically it's a win/win situation for equity bulls. With that said, the 2064 level needs to be cleared to solidify the bullish case. The market made a slightly new high today after a minor correction, so again the 5 count could have completed today at 2054, which is just 1 point short of my original 5 count target of 2055. But I see an expanding triangle on the micro count and that's usually a W4 or a megaphone top, so I'll give the bulls a chance to challenge the 2064 level. 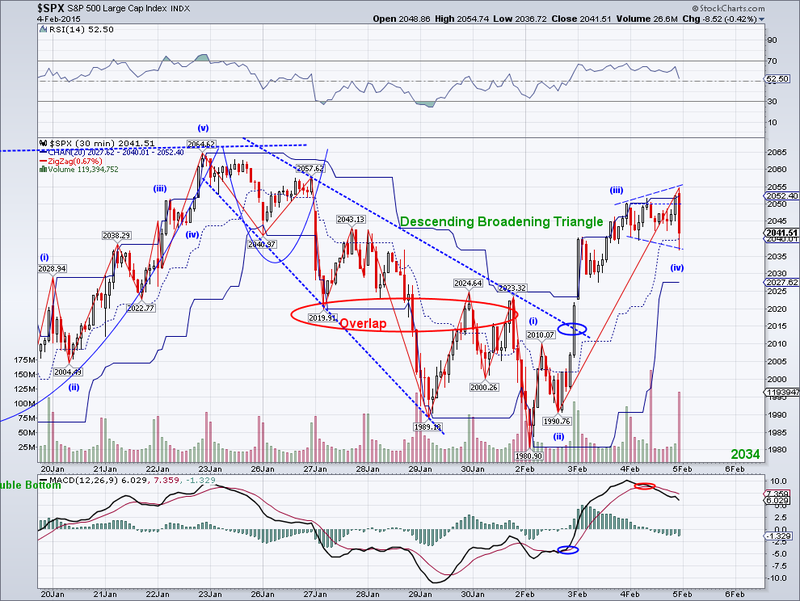 Actually, the target for that expanding triangle is 2074 so a completion of the pattern would solidify the bullish case. Oil fell almost 9% today, which I assume it's a B or a W2 wave. So we should see oil continue to support the market. It's interesting that oil companies barely moved today despite the inventory glut, but what that tells me is that the glut is already priced in. What oil and energy stocks are now pricing is the impact from lower production due to capex cuts. Just like too much investment led to overproduction, not enough investment can lead to an oil shortage. And in a way, this is what OPEC had in mind when they decided not to cut couple of months ago. It was a deliberate move to force out North American oil out of the market and essentially manipulate the market as they always have. So I ended up buying USO again, which I might exchange for oil company stocks but we'll see. My equity longs are doing well, they just need to go up 20% more! lol. The market followed through on the triangle break out on a bullish W3 and managed to close over the Trend Average and the 50 DMA. I'd like to see 2064 breached before giving the bullish case the all clear, but so far it's looking like the market is ready for another multi-week bullish leg given the bullish MACD cross on the daily chart. The excuse for the rally is oil (remember when a 7% rise in oil was actually a very bearish event!? ), so this factor will probably give support to the bullish case until euphoria takes over. The micro 5 count could be completed at 2050 and we'll know if we get a Trend Average test. For now, I labeled the micro waves assuming what we're seeing is still the W3. Oil will likely test its 50 DMA at $55 but I won't be surprised if it goes to $60. Too bad what got me stopped out on my oil position was an expanded flat, but there's really nothing one can do about it when trading against the trend. Whether this oil rally is just a bounce or a sign of a long term bottom remains to be seen, but as I've been saying for weeks, the supply side will end up working itself out and oil is bound to go back up as the world economy continues to grow. So I hope we'll get one final bearish wave eventually to another low to buy some oil companies. I suppose the "sweet spot" would be around $70-80 where consumers get the benefit of cheaper gas and energy companies can still operate at a profit. The market finally managed to breach its 1988 support and surprisingly bounced substantially before the 200 DMA was tested (The DJIA had a 200 DMA test). So far, we have a clear zig zag in place but that could turn into a bullish W3 tomorrow since the trendline from the descending broadening triangle was broken. If we see the Trend Average recaptured tomorrow in a W3, we should see trade north of 2055 and even a challenge to all time highs given the target for the triangle pattern of 2088. So far all the waves from the 2064 top look very choppy (specially for a bearish W3) and failure to gain traction means this is just another correction. Also, oil has officially turned bullish and could easily test its 50 DMA soon or even $60, giving support to the energy components of the markets and most importantly an excuse to rally.